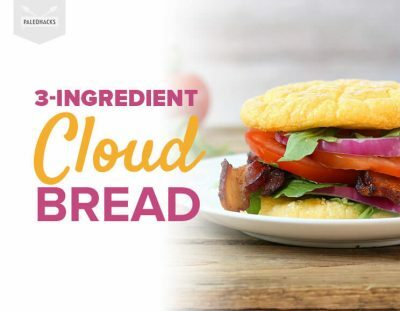 These airy cloud breads can be transformed into anything your heart desires – from mini pizza to a BLT sandwich. While the original version includes cream cheese, we swap in a healthy mayonnaise to keep them dairy-free. All you need are eggs, Paleo mayonnaise and a few pinches of baking soda. Start by beating egg whites and baking soda using a hand mixer until stiff peaks form. This takes about 3 minutes on high speed. Next, using a separate mixing bowl, whip together egg yolks and mayonnaise until smooth. Gently fold in the egg white mixture, careful not to deflate the foamy egg whites. Once combined, use a 1/3 measuring scoop to pour circles of the mixture onto a parchment paper-lined baking sheet. The circles will spread, so be sure to leave room in between. Bake for 25-30 minutes at 300°F. The bread should be firm and not jiggle in the center when done. Spread cloud bread with butter and strawberry chia jam for a sweet breakfast or top with your favorite pizza toppings for an Italian twist. 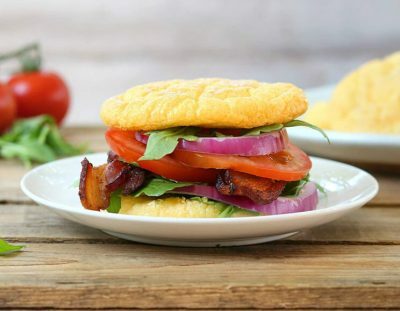 For a quick BLT-style sandwich, smear with mayo and pile on arugula, tomato, onion and cooked strips of bacon. You can also stir herbs like dried oregano and basil into the mixture when combining egg yolks and mayonnaise. For a sweeter bread, stir in a teaspoon of coconut sugar and ¼ teaspoon of cinnamon. Note: the texture fresh out of the oven on the crisp side; once the bread comes down to room temperature, the texture is soft and bread-like. 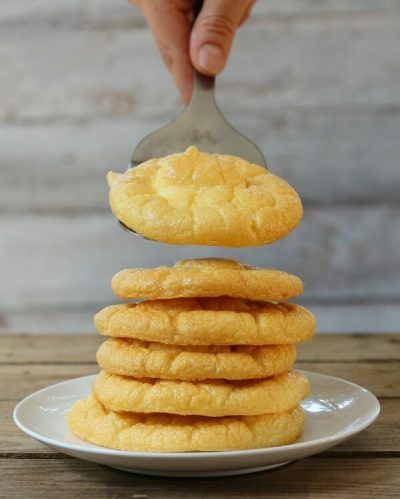 PS: Since these cloud breads are small and round, they make a great grain-free alternative to English muffins! Light and airy, these 3-ingredient cloud breads are easy to make and can be topped with anything from sweet jam to savory cashew cheese. Heat oven to 300°F and line 2 baking sheets with parchment paper. In a mixing bowl, combine egg whites and baking soda. Beat using a hand mixer until stiff peaks form. In a separate mixing bowl, combine mayonnaise and egg yolks. Beat until smooth. Gently fold in beaten egg whites. Use a 1/3 measuring cup to pour mixture onto baking sheet, leaving space in between. Bake 30 minutes, until firm. Top with your favorite Paleo toppings.